On Monday night, one is offered friendship, success and a cycle that begins. The JM has put together 24 suggestions to fill the first topic of the list of resolutions with the desire to have an unforgettable year-end. There is no shortage of events, for all tastes and pockets, where you can dine, watch the pyrotechnic show, relax to live music or dance until the sun rises in the first sun of 2019. The exit of 2018 is celebrated in this new space of Rua Dom Carlos I with a musical selection in charge of the DJ Ricardo Branco. The restaurant will have an ‘a la carte’ menu, and tickets for the party after the pyrotechnic show have a single price of 20 euros, with a drink included. Casino of Madeira – 7:00 p.m. The restaurant Bahia, Copacabana and Garden dress up to celebrate the arrival of 2019. The evening begins with a gala dinner, with musical entertainment by the trio of Miguel Pires and the usual show ‘Around The World ‘. After the climb to the terrace to watch the pyrotechnic show, the party continues at 00:30 in Copacabana, with DJs Márcio Costa and Luís Gonçalves, and in the Garden, with Phill.Me, Jay Camara and Michael C.
Salt Warehouse – 7:00 p.m. The restaurant at Rua da Alfândega dedicates its program to the divas of Hollywood. The Diva Trio Jazz Band will be in charge of the musical entertainment, in a gala dinner that offers five dishes, where the menus range from 160 to 200 euros per adult. The Madeiran – 7:00 p.m. The typical restaurant of Rua do Gorgulho prepares the entrance in the new year with a special menu with a value of 40 euros, which includes champagne at the entrance, main course, dessert and coffee. To accompany, the voice of the national artist Mico da Câmara Pereira, who should act between 19h30 and 22h00. It will be a black and white party in this space that has as scenery a panoramic view over the Bay of Funchal. The offerings are divided between the two restaurants of the center, with prices ranging from 160 to 290 euros per adult and between 80 and 200 euros for children. The program, which lasts until 4:00 a.m., includes a cocktail, dinner with a special menu, live music, sparkling wine and raisins accompanying the pyrotechnic show, supper and DJ party. Fifth Season – 7:30 p.m. Cocktail, gala dinner, privileged view over Funchal, sparkling wine and raisins, open bar, live music. All that the clients of this restaurant will be entitled to at Pico dos Barcelos, in a party that only ends after two in the morning. Pestana CR7 – 8:00 p.m. 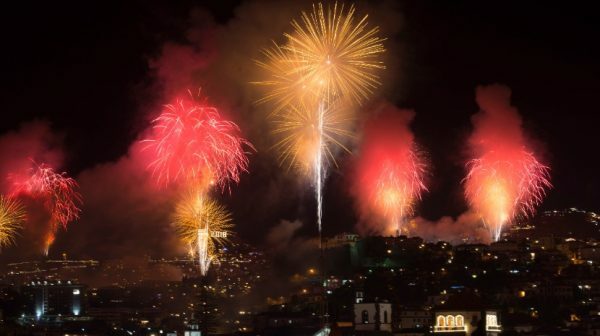 The rooftop of one of Madeira’s most famous hotels, which allows you to watch the fire with a 360-degree view over the Funchal amphitheater, is also the stage for this New Year’s Eve night. Dinner costs € 185 for adults and € 75 for children. It is possible to access the party on the terrace only by purchasing a ticket with a drink included for € 40. Live music and DJ ‘sets’ accompany the dawn until 4am. Porto Santo Line, as usual, offers another perspective of the unforgettable Madeiran pyrotechnic spectacle. The entrance for the ship will be made between the 22h30 and the 23, and must leave by the 23h15. After the fire, the Lobo Marinho docks again, opening the doors to those who want to spend the night on the ship to celebrate the new year. The tickets are still on sale, and attending the fireworks and participating in the party has a cost of 135 euros (67.5 € for children), and 60 euros to access only the party, where will be provided open bar, a cold supper, and live music. If the option is to spend the night outdoors with a poncho to accompany, the animation in this space of Zona Velha will be in charge of DJ Lino S. until 06.00. DJ W.A.G.A promises to take the bar from Rua das Fontes to the red, in an event that will be “total madness”. Until 06:00, the animation is right in this space known for its half-liter buckets. For 65 euros, it is possible to watch the pyrotechnic spectacle on the hotel terrace, with open bar and supper, to be served from 01h00. There will be musical entertainment with a guest DJ, and the party, which is with tickets sold in full, will last until 03h00. Two floors, two musical styles, two choices. It is the invitation of this space of Rua do Esmeraldo, for this free entrance party. On one floor will be the music selector Rui Pedro, Paulo Camacho, Mark Fári and Michael Yang. Animation, joy and good mood. It is the promise of this space, which guarantees that “the house goes below” with a year-end party whose entrance costs five euros. Of the music, will be in charge the DJ Fábio Costa.